When you’re out fishing on a bright summer’s day, the last thing you want is to have water glare on your eyes. All that squinting will leave you with an insufferable headache, and you’ll end up feeling so tired that your whole trip could get ruined. To avoid all that, you need to keep polarized fishing sunglasses in your boat at all times. They’ll keep your eyes protected from sun exposure and stray debris while giving you a detailed view of your surroundings so that you can actually see what you’re doing and what’s going on in the environment around you. The best part about polarized sunglasses, however, is the fact that they don’t even cost that much. As you’ll see, it’s not hard to get a good quality pair for under $50 that can actually last you for quite a long time. First of all, the sun is constantly releasing light waves, and once these waves hit a flat surface like lake water, they get reflected back to the surface. This process is known as horizontal polarization and it’s what causes that annoying glare which obscures your vision. What makes polarized sunglasses different from regular sunglasses is that they’re made from a type of lens that generates vertical polarization, and this in turn helps to reduce the glare caused by the horizontal polarization mentioned earlier. Unlike regular sunglasses that only work to reduce the glare hitting your eyes without improving your vision, polarized glasses will make everything appear clearer and more vivid. Plus, they come in different colors and shades, including light gray ones that only polarize the light, to dark tinted ones that significantly polarize and minimize the light. 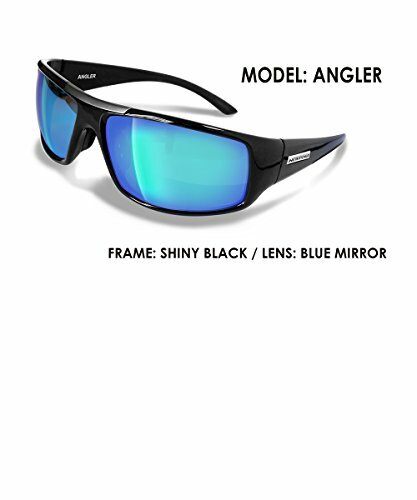 Here are just a few of the benefits offered by polarized fishing sunglasses. Minimize eye strain and avoid a potentially massive headache. If you want to look cool while still keeping sharp vision and protecting your eyes, then these aviator-style polarized sunglasses are for you. The lens is made from durable layers of scratch-resistant filters, which also happen to enable distortion-free optical clarity. Not only that, but they also offer excellent UV protection and have an optical coating which completely eliminates glare. 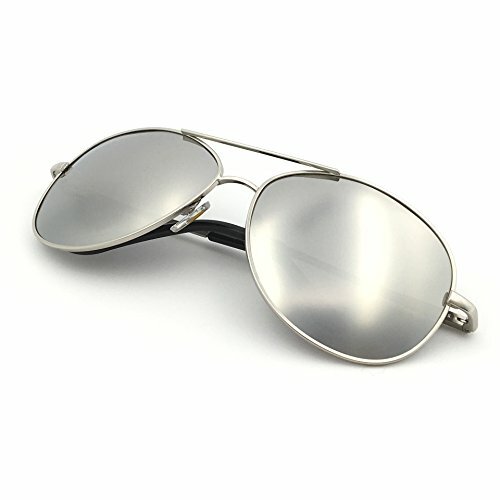 The frames, on the other hand, are made with high-quality metallic alloy with adjustable silicone nose pads that actually stay on to keep the sunglasses in place comfortably. These glasses also make a great gift idea, because they come pre-packaged in a cute little gift box. 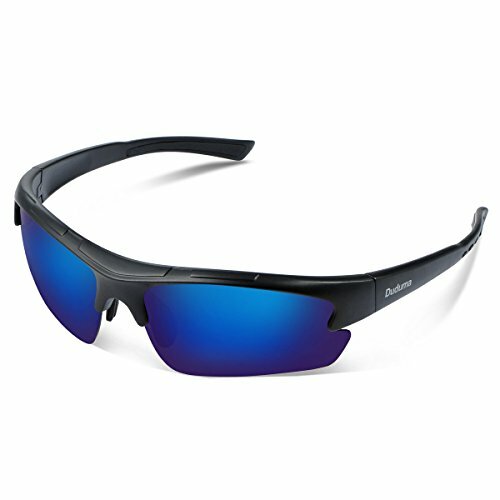 The Duduma polarized TAC lens sunglasses offer a plethora of benefits for anglers. For one, they’re designed to block out 100% of the harmful UVA/ UVB light rays that tend to hit your eyes when you’re outside while providing accurate color vision at the same time. The frames and lenses are constructed from polycarbonate material, which is resistant to dings, scratches and general impact. There are 7 TAC layers on the lens, with the very first one being the polarizing layer, the 2nd and 3rd make the glasses robust, tiers 4 and 5 absorb UV light, while the 6th and 7th layers provide shatterproof protection. Now, you’d think with all these layers that these glasses would be heavy, but they’re actually quite lightweight which means that you can wear them all day without feeling tired. Plus, if your Duduma glasses ever break, you’ll have the company’s Lifetime Breakage Warranty to fall back on, which is accompanied by a 30-day money back guarantee. Although these polarized glasses from Flying Fisherman look more like a fashion statement than a functional piece of eyewear, don’t let the good looks fool you. Thanks to having a middle layer of AcuTint polarized filter, these glasses sharpen visual acuity and enable underwater vision. Not only that, but they also eliminate glare, reduce eye tension and provide enhanced color contrast. The exterior is made up of a hard coating that protects against the elements, while the overall frame is constructed with crystal gunmetal with a stylish smoke lens. You’ll also be glad to know that these sunglasses provide full-proof protection against harmful UV ray exposure, plus they’re lightweight and available in different frame colors and lens shades. With a TR90 frame and lens combo that weighs only 0.60 ounces, these JiMarti polarized sunglasses are ultra-lightweight and quite comfortable to wear. However, that doesn’t take away from how durable and reliable they are, as they’re made from shatterproof polycarbonate material, which also happens to be resistant to scratches and impact. The glasses are also available in different shades and colors to suit different personalities, while the rimless design makes them perfect for all-day wear. The latter feature also enhances the field of vision while maintaining optimal glare protection. 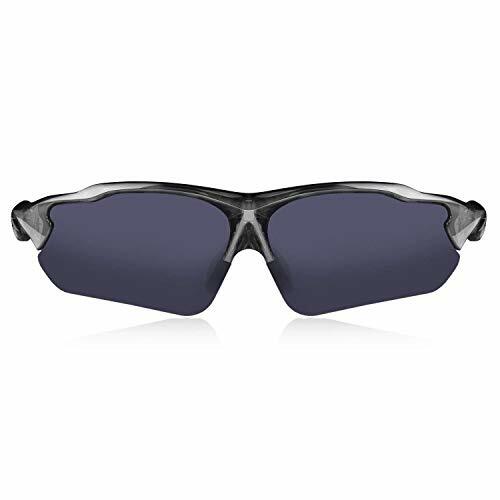 With a lightweight titanium plastic frame and HD polarized lenses, these sunglasses are not only lightweight and comfortable to wear, but they’re also resistant to high temperatures and are shock absorbent. Their classic and straightforward design includes side ventilation to enhance the comfort factor while making them an ideal option for both men and women. In addition to the limited breakage warranty, this brand offers 100% satisfaction - or your money back. These sunglasses from Hulislem work so good that they even have a seal of approval from the FDA! 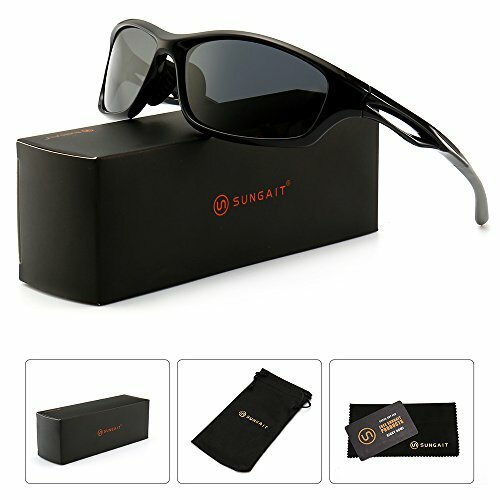 According to the manufacturers, the design was inspired by aircraft technology, as evidenced by the specialized features such as the iridium lens coating which completely eliminates sun glare. The HD lens is polarized to give you an enhanced view of your surroundings so that the landscape is more vivid and detailed as a result. Also, the stress resistant and durable O Matter frame, rugged enough to meet up to whatever challenges you throw at it, makes for a super comfortable fit; which, is only made better by the 0.8-ounce lightweight design. For added comfortability, there is air ventilation on the sides to keep you fresh throughout the day, and they’re available in different colors, with a low-profile and elegant design. The Under Armour Keepz glasses are made from sturdy polycarbonate titanium and plastic, and you can tell from their construction that they’re prepared to be worn outside. 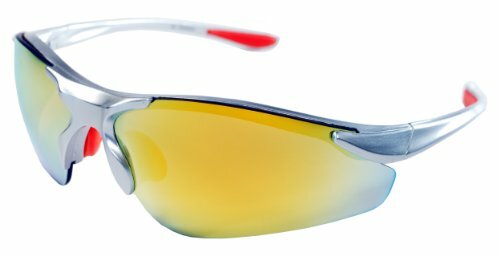 For one, they feature the patented ArmourSight® lens, which offers clear peripheral vision, enhanced color retention, and scratch resistant durability. The nose pad is easily adjustable, and they can actually repel water which makes cleaning them a breeze. These glasses also offer excellent UV protection and are so lightweight that it’s easy to forget that you’re wearing them after some time. Simple yet elegant, these Newport glasses are entirely polarized and offer 100% glare and UV protection, with a mirrored lens and a lightweight plastic frame. They also fit very comfortably, thanks to the rubber nose pad, and they’re so versatile that you can even see underwater with them. Plus, these glasses are available in different styles, sizes, and shades so that no matter what your head size or preference is, you’re bound to find one that suits your needs. Great lenses - can even see under water! We all know the importance of wearing sunglasses to protect our eyes when the sun is out. Regular sunglasses are good and well for general purposes, but if you’re an angler, then you’re going to want something with a little more protection. Polarized sunglasses are ideal for outdoor conditions because they not only protect the eyes from UV ray exposure, but they also improve overall visual clarity and can even enhance the vibrancy of your surroundings. Of all the polarized sunglasses we reviewed, the J+S aviators really stood out, because, in addition to keeping your eyes protected from glare and UV ray exposure, they’re also durable, scratch resistant and offer distortion-free optical clarity.